A nicely made version of the classic Multum in Parvo trick, where milk is poured from a large glass into a smaller glass, then into an even smaller glass, and finally into a tiny glass. 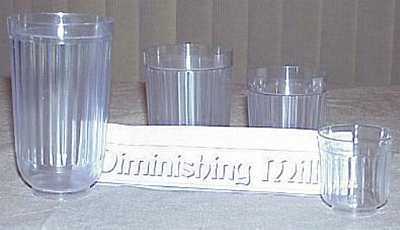 The glasses are heavy duty plastic, much more durable than real glass for the working magician. The big glass is 5.5" tall and 3" in diameter. The second glass is 4" tall, the third is just over 3" tall, and the mini glass is just 2" tall with a 2" diameter. This is a stunning visual effect with automatic audience appeal. As the milk seemingly shrinks from one glass to the next, finally ending up in a tiny little glass, which can be given out to drink, or gulped down by the magician. Great, great magic!! Kids go wild to see the big glass of milk squeezed into a tiny (almost shot-size) glass.